By now you probably know about the toxins in your food (pesticides, chemical fertilizers, GMO’s, etc. ), but did you know that many of the household products and body care products that you use daily are also toxic to the human body? Everyone assumes that what is for sale at the store is safe right? Not so! 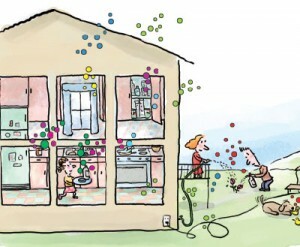 Besides the air pollution and water pollution outside, our homes are filled with toxic products. A growing body of research suggests that chemicals in everyday products may put us at risk for health problems – from infertility and birth defects to certain types of cancer. In fact, the U.S. Centers for Disease Control and Prevention now monitors a total of 298 environmental chemicals that have been found in humans, including many used in consumer products. These chemicals can gradually build up in the body, potentially making you sick. Ever wonder why clear plastic containers turn cloudy after running through the dishwasher a few times? Plastic breaks down over time, and this breakdown can release dangerous chemicals into your food. Many plastic containers are made from chemicals including phthalates, which act as endocrine-disrupting chemicals (EDCs). Switch to glass containers. You don’t necessarily have to toss these, but don’t heat them up in the plastic. Heating plastic can release chemicals that seep into your food. It’s well worth your time to take a few extra seconds to transfer prepared foods into a glass container before heating them in the microwave. Many nonstick pans contain trace amounts of a chemical called perfluorooctanoic acid (PFOA), which has been shown to cause cancer in laboratory animals. The pans’ non-stick lining can scratch or chip off into your food. Instead, use cast iron or stainless steel cookware, and natural, non-stick sprays such as olive oil. I never allow artificial air fresheners in my home. Anything you breathe in eventually ends up in your bloodstream. Plug-in scents or synthetically scented candles many contain chemicals called phthalates, which have been linked to reproductive problems. Instead, choose candles made with essential oils and fresh flowers to scent your home. Also, try using baking soda and white vinegar as odor absorbers. The one-word ingredient “perfume” can translate to a product containing upwards of 300 chemical ingredients. (Perfume companies won’t release lists of exact ingredients for fear of divulging secrets to their competitors.) Avoid perfumes and colognes or switch to products that are scented with natural oils. Stain blockers essentially create an invisible plastic barrier over your furniture. This plastic will eventually wear off and be released into your home environment. Instead, simply clean stains as necessary rather than trying to prevent them. Check the labels of cleaning products for chemical ingredients such as phthalates and chemical surfactants. Natural products like baking soda, Borax, soap powder, vinegar, lemon and hot water work just as well without coating your home in toxins. From shampoo to lipstick, the average American woman applies up to 12 personal care items, and the average man up to six, to their skin each day. That adds up to roughly 126 unique ingredients, according to the Environmental Working Group, a public health advocacy organization. Opt for cosmetics with mineral-based pigments and natural oils. Choose soaps and shampoos free of synthetic fragrances and chemicals such as triclosan, which has been found in animal studies to alter hormone regulation. Many antiperspirants use aluminum-based compounds and other chemicals, which are absorbed into the sweat glands. While there are ongoing studies on possible health impacts of antiperspirants, I advise avoiding any chemicals that are absorbed into the body for non-medical purposes. You can find aluminum-free antiperspirants, and there are many chemical-free brands of natural deodorant sticks and sprays that don’t contain parabens and all ingredients with ‘PEG’ in their name (such as PEG-8 and PEG-40 hydrogenated castor oil). Research on animals suggests that chemicals in some sunscreens, including oxybenzone, maycause health problems when they penetrate the skin. The safest sunscreens are made from minerals such as zinc oxide and titanium dioxide, but they can be very expensive. In general, avoid aerosol spray sunscreens, which you can accidentally inhale, as well as sunscreens containing chemical ingredients such as oxybenzone, octinoxate, retinyl palmitate (a form of vitamin A), and fragrances. When you’re looking for safer products, keep in mind that term “natural” means almost nothing in the food and cosmetics industry, as it’s not regulated by the FDA. Instead, look for “organic” labeling, because organic ingredients are federally monitored, and really mean something in the food and cosmetics world. Of course, it may not be practical for you to toss all of these items at once. Instead, try swapping out one product at a time with a safer version. 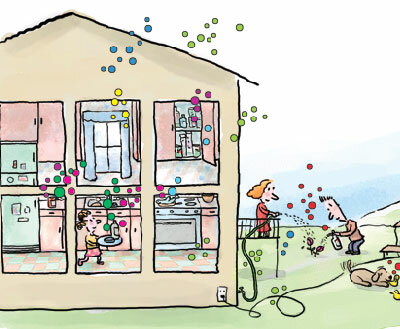 Even small steps to minimize your chemical exposures can create a healthier and safer home. Take a look at the ingredients in your household products and see if you could make some better choices in the future, your health will appreciate it!